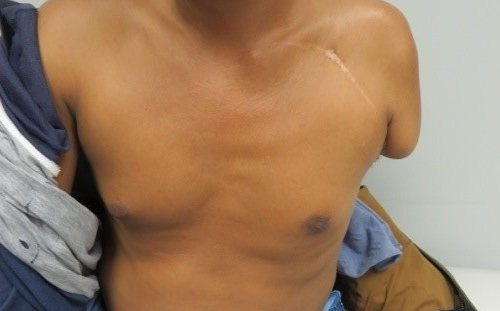 Arm amputations (at all levels) are predominantly caused as a result of some form of trauma to the arm. This can be work or industrial accidents, car or motor cycle accidents, electric shock, burns, explosions and dog bites. 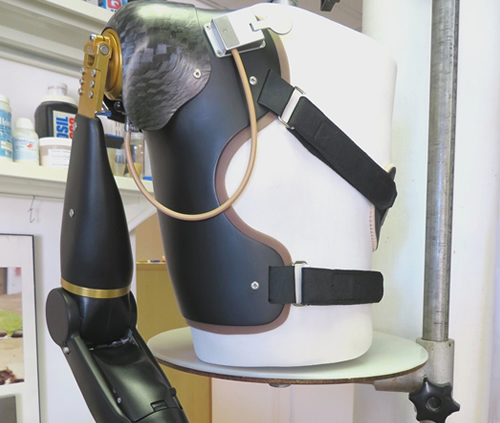 The mechanical arm prosthesis – moves by means of cables and a body harness. 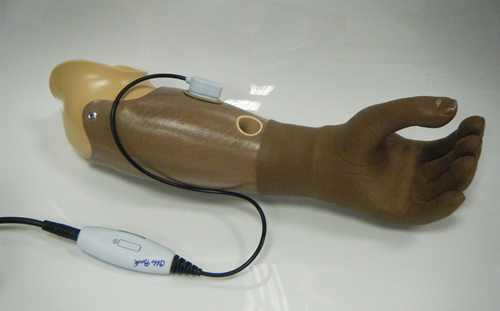 The Myoelectric arm prosthesis – moves by means of electrical motors and skin surface electrodes. 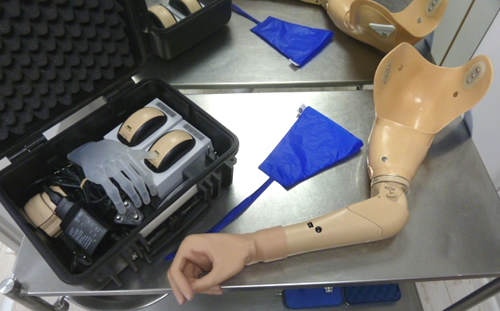 In some special cases it is possible to combine the two types – for example, having a mechanical cable controlled elbow, combined with a myoelectronically controlled hand. In the modern world today, mechanical prostheses are generally considered as extremely outdated and in most cases, any myoelectric prosthesis would provide better and more sophisticated function and would be the prosthesis of choice if it can be afforded. The cost is significantly lower – so it may be the only option for limited budgets. Where an individual is likely to cause damage to a sophisticated myoelectric prosthesis, such as working in dirty, dusty or wet environments, perhaps also for sport or recreational activities. Such an individual may therefore have both a mechanical prosthesis (for dirty work) and a myoelectric prosthesis for other activities of daily living. Where an individual may not have access to electricity for extended periods of time. If no suitable myolectronic muscle signals can be found to operate the myoelectric prosthesis. 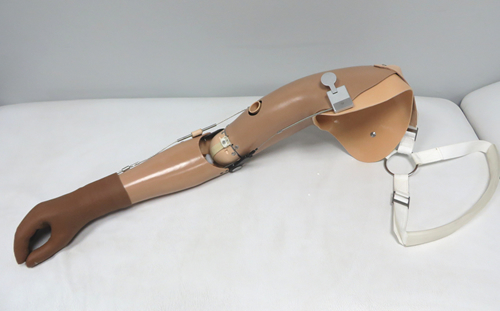 The function of a mechanical prosthesis is achieved by means of a body harness that is connected by means of a cable (or set of cables) to the hand/or terminal device and if applicable, the elbow of the prosthesis. 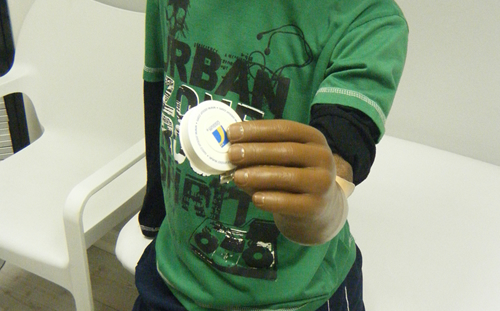 By pulling the shoulders forward, called ‘’shoulder excursion’’ tension is applied to the cable – which in turn opens the prosthetic hand. 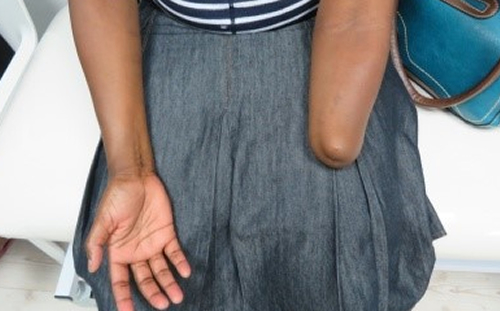 When the tension is relaxed, a spring or strong elastic closes the hand or terminal device, such as a prosthetic hook. 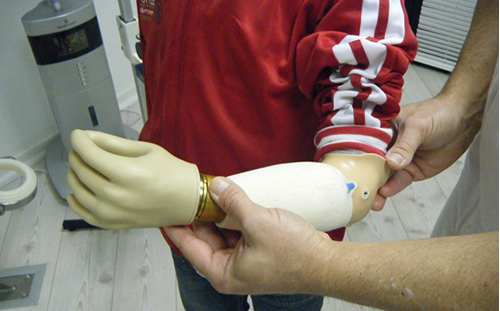 Above elbow-mechanical prosthesis – cable visible on outside of prosthesis. Shoulder "Excursion" – pulling shoulders forward exerts a pull on the cable to operate elbow and hand. To a certain extent, the control strategy of a mechanical prosthesis by means of a harness and shoulder excursion (pulling the shoulders forward) is considered as unnatural or un-physiological. 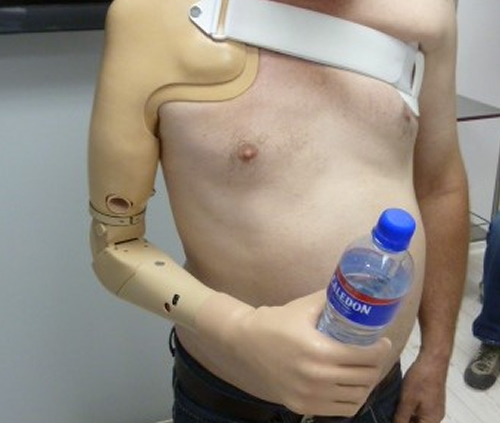 The functional ‘’window’’ of the prosthesis is also significantly smaller than that of a myoelectric prosthesis, which functions more physiologically correct by means of muscle contractions on the residual arm. 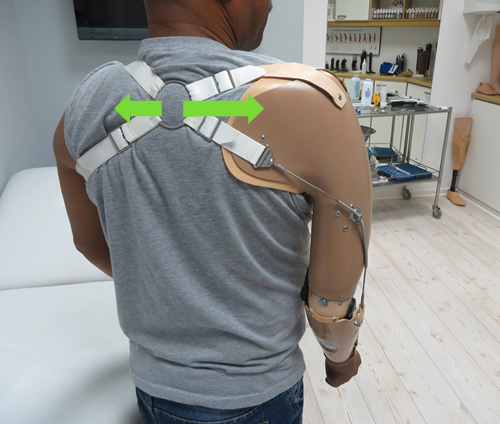 As a practical example, a mechanical below elbow prosthesis would only function relatively well if a functional task is performed in a ‘’window’’ between hip and shoulder height level, where it is possible for the amputee to perform the shoulder excursion effectively. 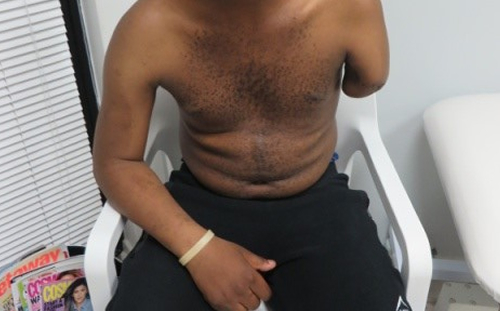 As soon as the amputee has to do a functional task, lets say above head, or near the ground, it is very difficult to perform the shoulder excursion and operate the prosthetic hand. 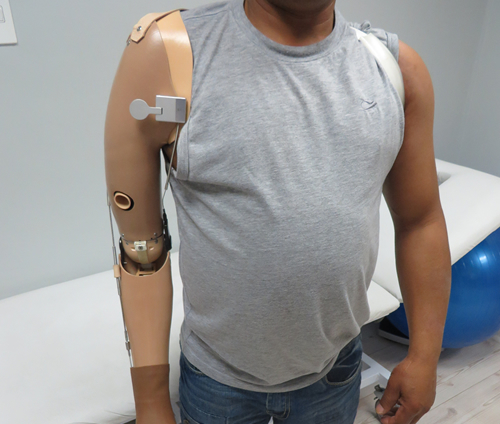 Below elbow-mechanical prosthesis – cable visible on outside of prosthesis. Operational ‘’window’’ generally between hip height-to shoulder height. Myo electronic prosthesis refers simply to the fact that they prosthesis functional components are driven by electrical actuators (motors), supplied by energy by means of batteries, with control commands provided by means of skin surface electrodes that detect muscle contractions below the skin. 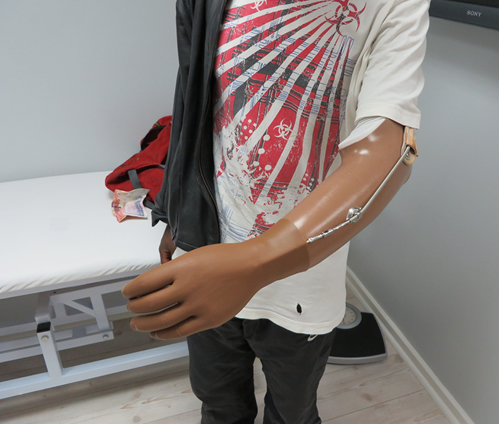 "Hybrid Prosthesis" - Myoelectric hand and elbow / mechanical shoulder joint. Boston Elbow with Bebionic 3 Small hand. Generally, much easier to operate. Physiologically more correct, muscle signals use to operate the prosthesis components, no need for unnatural body movements such as shoulder excursion to pull on a cable. This make the prosthesis more comfortable to wear and use. 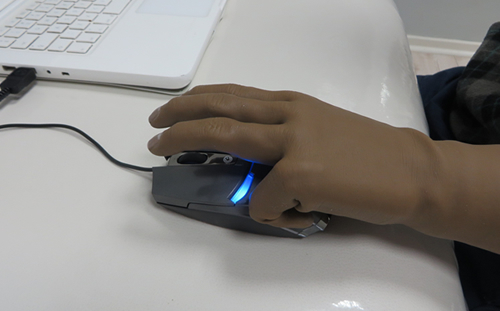 With advanced – multi articulating hands, many more sophisticated grip patterns and functional tasks, such as working with a computer mouse. Can include components such as electric wrist rotators that enables the performance of additional functional tasks, such as pouring water from a bottle into a glass without the need for shoulder rotation. 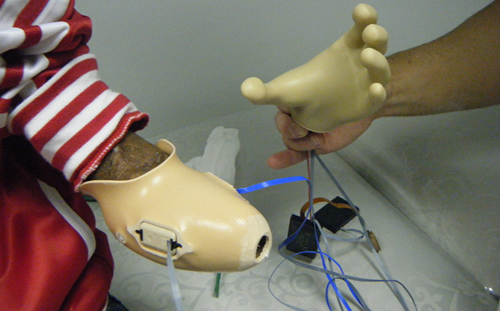 Terminal devices can often be interchanged, such as exchanging a hand, for a functional hook to perform different tasks. Proportional control. Grip speed and grip strength can be controlled by means of the muscle contraction detected through the myoelectronic electrodes. Identification of suitable myoelectronic signal sites on the residual arm. Ideally two sites are identified, one to open the hand, one to close the hand. These sites are marked and an impression taken of the residual arm. Manufacture of test socket to test if myoelectronic signal sites are correctly located in the socket. Electrodes are inserted into socket and connected to a myoelectronic hand and battery and tested if the hand can be operated effectively. 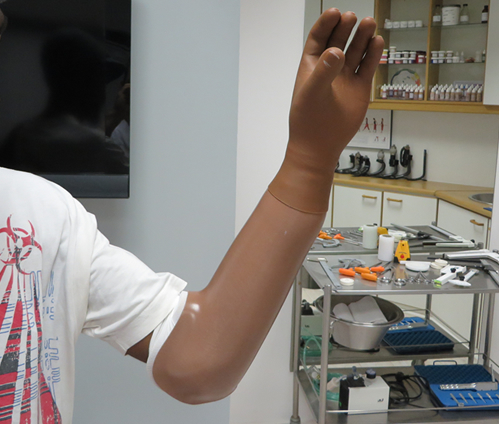 The prosthesis forearm structure is manufactured and the correct length, alignment and orientation are determined. The final prosthesis lamination is completed and all the different prosthesiscomponents assembled with a cosmetic glove covering. 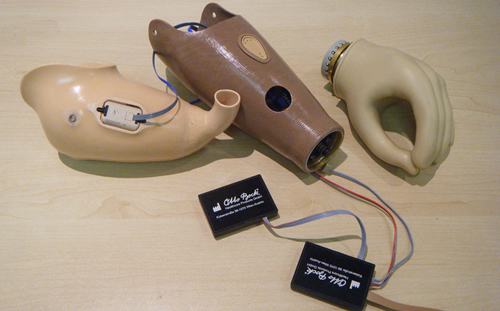 The prosthesis battery is charged fully before first time use. Prosthesis fitted and functionally tested on patient. 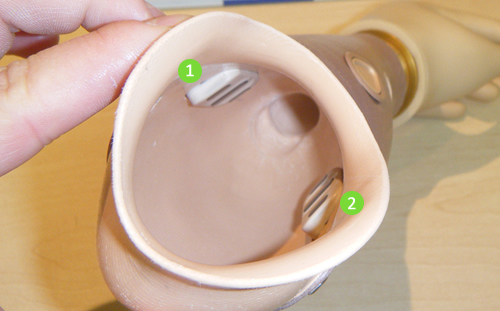 The respective opening and closing electrodes can be seen located within the prosthetic socket. 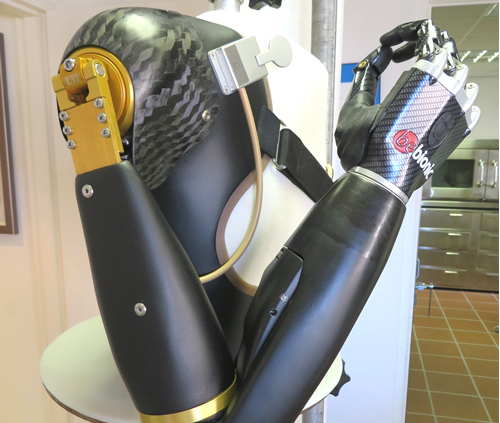 The below images shows an advanced myoelectric prosthesis with a multi-articulating hand, the BeBionic 3 Small Hand. This hand has advanced grip patterns for specific tasks such as holding a computer mouse, and allowing a "single" and "double click" in computer use. 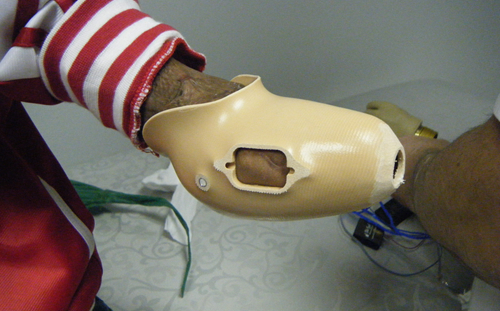 Prosthesis with BeBionic 3 Small hand – Silicone Inners socket removed to show electrode location. 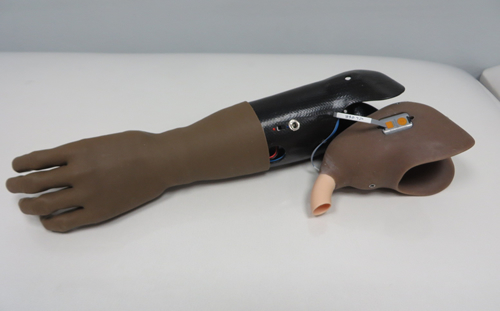 Prosthesis with BeBionic 3 Small hand – in "mouse mode". 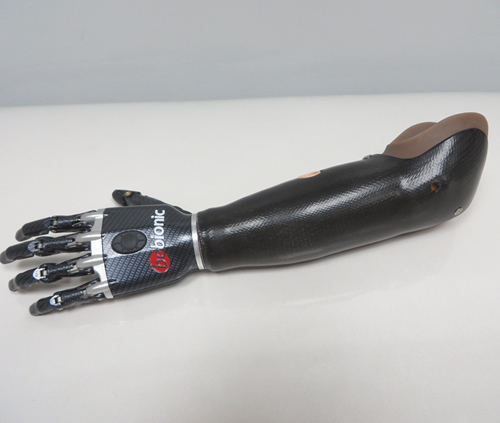 Prosthesis with BeBionic 3 Small hand – used in "mouse mode" used in operation of laptop computer.